“People imagine poets are perpetually inspired. This perfectly captures the foundational ideas on which Christodoulos Makris’ second collection, The Architecture of Chance, is built. Described by Rick O’Shea as “one of Ireland’s leading contemporary explorers of experimental poetics”, Makris’ collection examines the nature of chance encounters in contemporary society, and how a poet like himself can depict these experiences. Taking snippets of overheard conversation, or stumbling upon other artists’ works and reimagining them in his own form of contemporary poetry, or by taking different forms of modern day media to highlight political and economic issues Makris creates this unique collection. Makris offers a unique take on the piece by using his own art to comment. His poem “From Something to Nothing” with its subheading “Francis Alÿs” follows in the same style. Research into obscure artists on the Internet shows that Alÿs’ poetry often concerns itself with political conflicts. In Makris’ poem he takes the International Monetary Fund’s “about” section directly from their website, runs it through Google translate into eight different languages, and repeats this four times, each translation becoming slightly different from the last. It is simple yet poetic procedure, with the repetitive nature of the diction used fulfilling the phrase “From Something to Nothing”. Typography mimicking definition is a contemporary construct, and one which Makris employs expertly throughout his work. This use of social media again shows Makris’ ability to find poetry in the modern everyday, whilst also discussing serious political matters at its core. 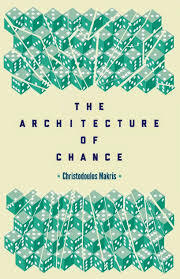 The Architecture of Chance experiments with a wide array of techniques, which combined together create an excellent contemporary poetry collection.